A quick backstory and we were into the game. Can you escape the famous Soldado Pirate shipwreck with Captain Chiver’s most prized and valuable treasure before his ghost that endlessly haunts the ship finds you, and drags you down into his watery grave? You have 60 minutes to search the ship and find your way out with the riches. Wow. I hadn’t expected this when playing one of the franchise’s older games. It’s genuinely a pretty room – far more impressive than almost every other game I’ve played at Breakout. Even better, the room was filled with fun logical puzzles that had us bouncing rapidly around with the props woven into the game. There was searching to be done but it was generally directed, which is far more enjoyable than a detailed search of the entire room. In fact, the whole game felt very natural – always leading us quickly to the next puzzle. There was just one exception: a horrible search-based observation puzzle which would have been painful if we hadn’t happened to bypass it by solving an anagram using only four of the five letters (is that brute forcing? Does it make any difference that, once we had all five letters, there were still multiple solutions?). Indeed, the game was so natural that almost as soon as we’d started, we’d finished. Like this review, it was over before it had barely begun. In a weird turn of events, we had everything we needed to escape the room after just 14 minutes. Yes, 14 minutes. After one of our team had exited the room, we tried to solve the remaining letter of the anagram but had to resort to a clue. This is a strange game to review. For the 14 minutes I was playing it, I really enjoyed the experience. It’s supposedly on the easy side of Breakout’s games, so perhaps I should cut it more slack, but it’s hard to justify playing something this easy. Less than a quarter of an hour in the game just isn’t good value. I can’t recommend this to experienced players but, for absolute novices, it’s a fun introduction with logical puzzles, a pretty set and a decent chance of escaping. Uff … 14 minutes is not enough time for a game that is designed for 60 minutes – even for experienced players. It’s weird that they are not putting more puzzles into the room if it is already rated as their easiest room.. We had a similar experience in Budapest when we did a LOST themed room .. I think as a player you just felt like those rooms are not worth the money. No. Definitely not but it was weird coming out of the room having actually quite enjoyed it. It’s really hard to factor that in to the overall rating – experienced players just shouldn’t play this game but I might recommend for absolute beginners, especially children. 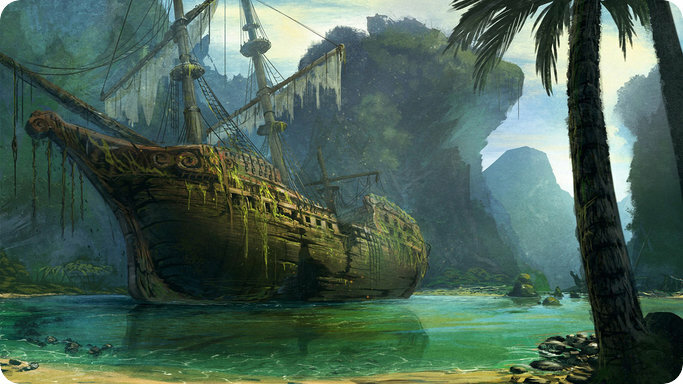 The theme shipwrecked is interesting to me. But if it takes only 14/60 mins to finish the game then I think it is very short. Agree it can be fun and enjoyable but room designers should find a way to make it a 60 mins or close to that duration enjoyment.